A colorful slaw recipe that is perfect for any barbecue. 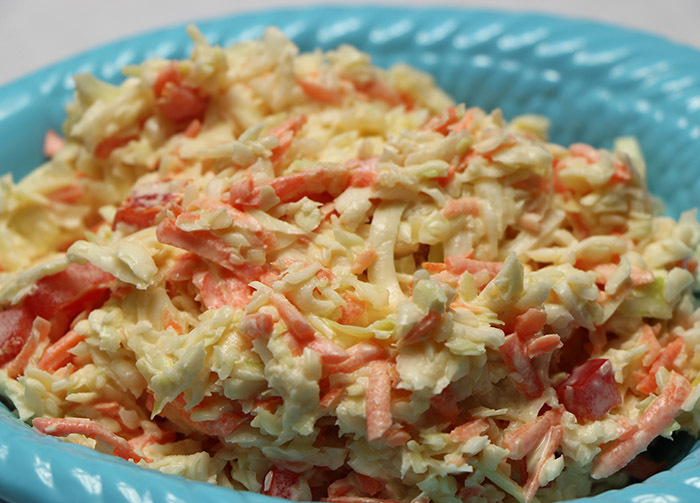 Crunchy and tangy, this cole slaw recipe is always a favorite in the summer time. For more of a bite, use white vinegar in place of the apple cider vinegar. Best if made at least 3-4 hours ahead. Celery seed can be added for another level of flavor. If you have a food processor with the grater attachment, use it; it’s a real time saver. Otherwise, a box grater will work just fine. Peel the first 2-3 layers of leaves from the cabbage. Wash thoroughly and dry. Cut cabbage into 1/8ths pieces (wedges) and grate, using a food processor or box grater. Grate the carrot in the same manner. Add grated cabbage, carrot and diced red pepper to a large mixing bowl. Toss to combine. In a medium mixing bowl, add all remaining ingredients and whisk until thoroughly combined. Pour the mayonnaise mixture on top of the vegetable mixture and use a rubber spatula and toss to combine. Taste and adjust seasoning with salt if required. Note: I recommend making this up to 1 day in advance to allow flavors to meld. This slaw is meant to have a nice sharp bite on the palate.